G-Fast can be set up various ways, however the fully wired “fiber to copper” or “fiber to Home” ( FTTH ) would provide safe, fast and secure connections. If needed, home owners could use wireless at the end point. No sense in exposing homes to wireless if they don’t even use it – or where their health is effected by it. Telus is familiar with the G-Fast technology, as they followed the early discussions about its development in the UK. Telus has fully wired some homes in British Columbia, yet some have had problems with the Telus Optik boxes emitting RF when Telus said there would not be any wireless signal. If G-Fast is actually safe, and it appears that some of the configurations do not use wireless, then this would be a good alternative to the wireless eNodeB / Small Cell that Telus and Bell have decided to install. After a more than four-year project phase, the new transmission standard will now be applied across Switzerland as part of the regular Fibre to the Street (FTTS) expansion. The technology will allow Swisscom to quickly and cost-effectively provide high transmission speeds to up to 500 Mbps. In the course of the more than four-year project phase, Swisscom and its technology partner Huawei worked together to develop specific solutions for the Swiss market. 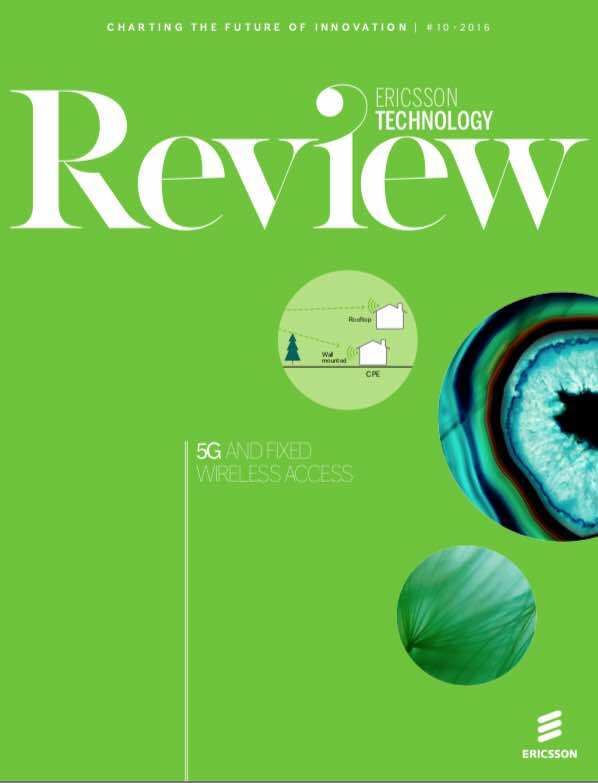 Swisscom had already successfully provided the first pilot customers worldwide with the final standard of G.fast and thereby gathered key insights for its further development in spring 2015. Since September 2016, only G.fast-compatible 16-port hardware has been used for the Switzerland-wide FTTS expansion. With FTTS, fibre-optic cables are laid up to a distance of around 200 metres from the building. We then use the existing Copper cable infrastructure for the remaining distance. In 2017, the transmission standard will also be integrated into 48-port hardware as well as into the Fibre to the Building (FTTB) expansion. This term is used either as a blanket term for both FTTH and FTTB, or where the fiber network includes both homes and small businesses. FTTH (fiber-to-the-home): Fiber reaches the boundary of the living space, such as a box on the outside wall of a home. Passive optical networks and point-to-point Ethernet are architectures that are capable of delivering triple-play services over FTTH networks directly from an operator’s central office. 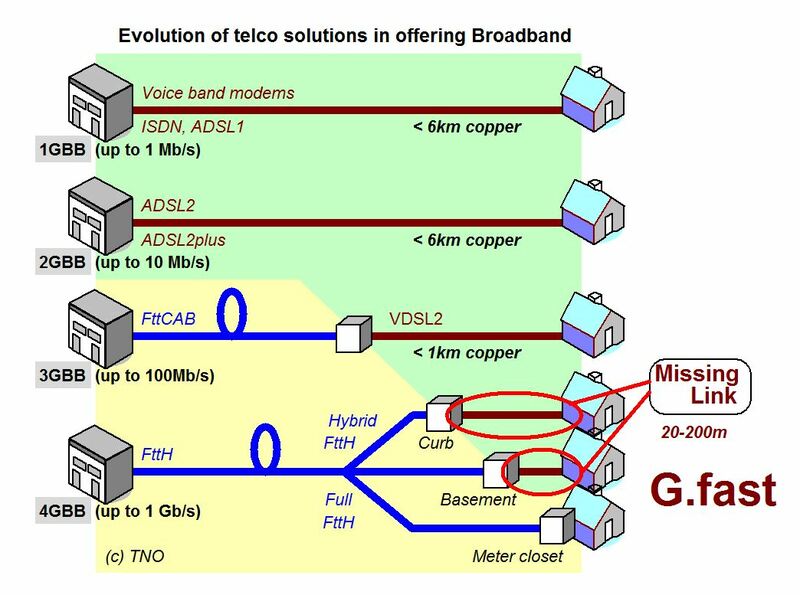 FTTB (fiber-to-the-building, -business, or -basement): Fiber reaches the boundary of the building, such as the basement in a multi-dwelling unit, with the final connection to the individual living space being made via alternative means, similar to the curb or pole technologies. FTTD (fiber-to-the-desktop): Fiber connection is installed from the main computer room to a terminal or fiber media converter near the user’s desk. FTTO (fiber-to-the-office): Fiber connection is installed from the main computer room/core switch to a special mini-switch (called FTTO Switch) located at the user´s workstation or service points. This mini-switch provides Ethernet services to end user devices via standard twisted pair patch cords. The switches are located decentrally all over the building, but managed from one central point. FTTE / FTTZ (fiber-to-the-telecom-enclosure or fiber-to-the-zone) is a form of structured cabling typically used in enterprise local area networks, where fiber is used to link the main computer equipment room to an enclosure close to the desk or workstation. FTTE and FTTZ are not considered part of the FTTX group of technologies, despite the similarity in name. FTTF (fiber-to-the-frontage) This is very similar to FTTB. In a fiber to the front yard scenario, each fiber node serves a single subscriber. This allows for multi-gigabit speeds using XG-fast technology. The fiber node may be reverse-powered by the subscriber modem. 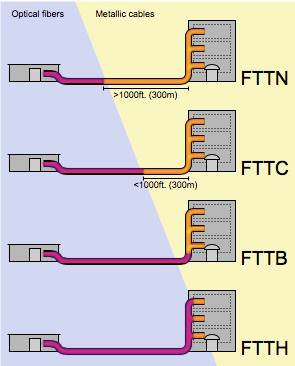 FTTN / FTTLA (fiber-to-the-node, -neighborhood, or -last-amplifier): Fiber is terminated in a street cabinet, possibly miles away from the customer premises, with the final connections being copper. FTTN is often an interim step toward full FTTH (fiber-to-the-home) and is typically used to deliver ‘advanced’ triple-play telecommunications services. FTTC / FTTK (fiber-to-the-curb/kerb, -closet, or -cabinet): This is very similar to FTTN, but the street cabinet or pole is closer to the user’s premises, typically within 1,000 feet (300 m), within range for high-bandwidth copper technologies such as wired ethernet or IEEE 1901 power line networking and wireless Wi-Fi technology. FTTC is occasionally ambiguously called FTTP (fiber-to-the-pole), leading to confusion with the distinct fiber-to-the-premises system. Deutsche Telekom has said its fibre-to-the-curb network using VDSL vectoring across legacy copper lines is the only way to reach all premises across the country in a timely and cost-effective way. Deutsche Telekom has defended its use of VDSL vectoring technology across legacy copper lines during its nationwide broadband project, saying it would be “impossible” to build out fibre-to-the-home (FttH) connections across Germany due to time, cost, and construction constraints. “We are committed to vectoring, because it is the only way to provide people in rural areas with faster lines quickly,” Deutsche Telekom said in a blog post published on Thursday. “If we are fixated on FttH, those in the countryside will remain left behind for years. It is simply impossible to roll out fibre lines to homes everywhere in the country. Neither the construction capacity nor the funding is available for that. Deutsche Telekom’s broadband network involves rolling out fibre to nodes and curbs (FttN/C), with vectoring then used to reduce any signal interference that could slow down the speeds attained across existing copper lines between the box and the home, allowing for download speeds of up to 100Mbps.